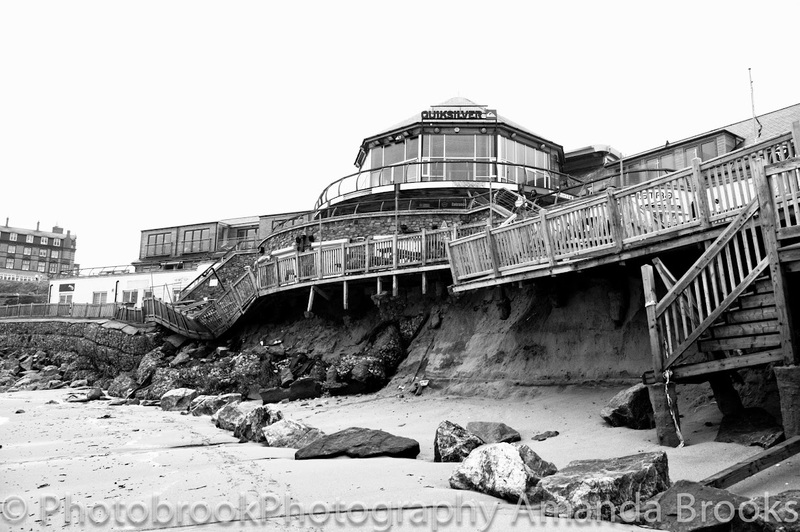 Photobrook Photography: A week of storm damage in Cornwall. A round up of pictures from around the coast. A week of storm damage in Cornwall. A round up of pictures from around the coast. For most last week was the first full week back to work after the Christmas break and in terms of weather, what a week! With gale force winds, giant swells and high spring tides this created a combination to cause damage and flooding across Cornwall. Luckily the majority of the damage is repairable and a lot is just damage resulting from debris leaving a lot of mess to be cleaned up. Although their have been two fatalities and one young man still missing the scene could have been a lot worse if people hadn't listened to the coast guards warnings about staying away from the coast. Starting my round up of the week are some photographs from Fistral Beach storm damage where the RNLI hut and the Fistral beach bar took full force of the storm swell. The sand dunes also saw dramatic change where they have been eroded back around 10 foot. This wasn't the only beach were the sand took on a completely new look. Perranporth beach with the famous bar on the beach the Watering Hole also saw dramatic changes. The storm damage at Perranporth luckily did not effect the Watering Hole but it has left a massive six - eight foot cliff of sand carved by the sea in front of the pub. The once gentle sloping sand from the shore up to the pub is no longer there! It wasn't just the beach in Perranporth that saw change but the town as well was covered in a layer of debris and rubbished washed into the land by the extremely high tides. Monday saw the biggest swells hit the coast with 30 foot waves impressing the coast line. The biggest waves were forecast at Sennen during the storm and were definitely worth watching. The massive waves came crashing into the coast creating impressive spray and thunderous sounds. Porthleven during the storm is always impressive picking up the swell on the south coast there is often some very impressive photographs of waves smashing up the harbour and flooding the seaside town. I visited Porthleven during the height of the storm but at low tide when it was safe to do so. Even at low tide the waves were looking angry and surging into the outer harbour of the fishing port. After the week of strong storm swells that left beaches changed I'm now heading off out to one of my favourite beaches Fistral to help with a beach clean and return the beaches back to their beautiful state before they were damaged by the storms.